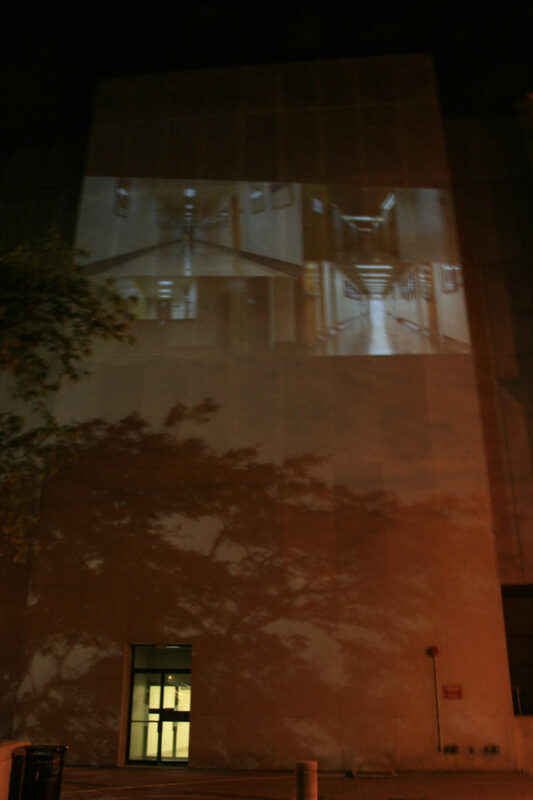 Opening, 2011–12, standard definition color video, sound, 7:25 min. Single-channel, hd video projector, image approx. 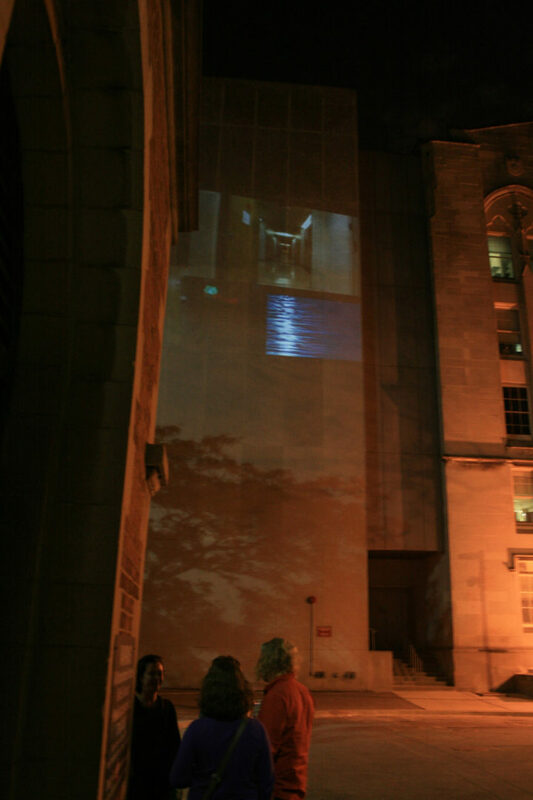 20 x 30 ft, sound, continuous loop. Surgery-Brain Research Pavilion, 5812 S. Ellis Avenue, University of Chicago, IL, USA, May 11, 2012. 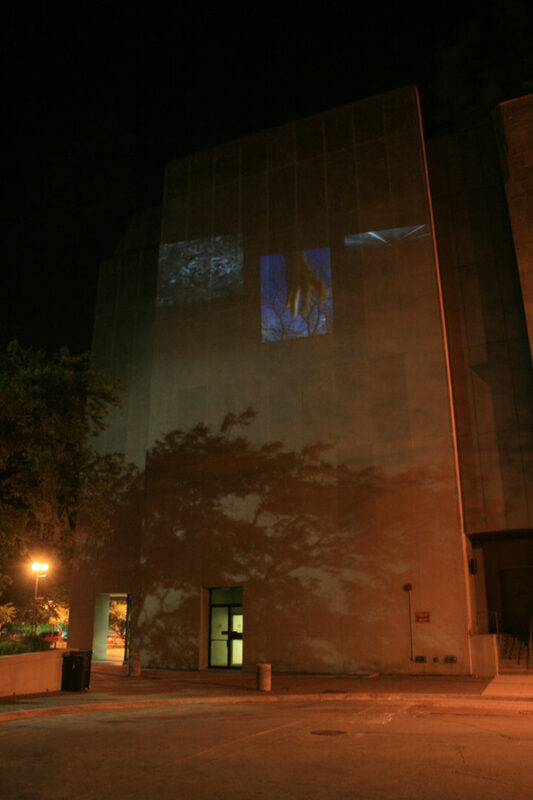 Clemens (Biology) and Ferrari (Visual Art) will explore the nature of neuroscience through a nighttime video projection onto the Surgery-Brain Research Pavilion (5812 S. Ellis Avenue). An audiovisual montage of original and archival materials relating to various brain processes, this project will comprise formal manipulations of color, speed, rhythm, and sound, reflecting the spatiotemporal concept of neural activity. Furthermore, a narrative will examine the rift between scientists and the public, highlighting the complexity of the brain as both a subject and means of inquiry. 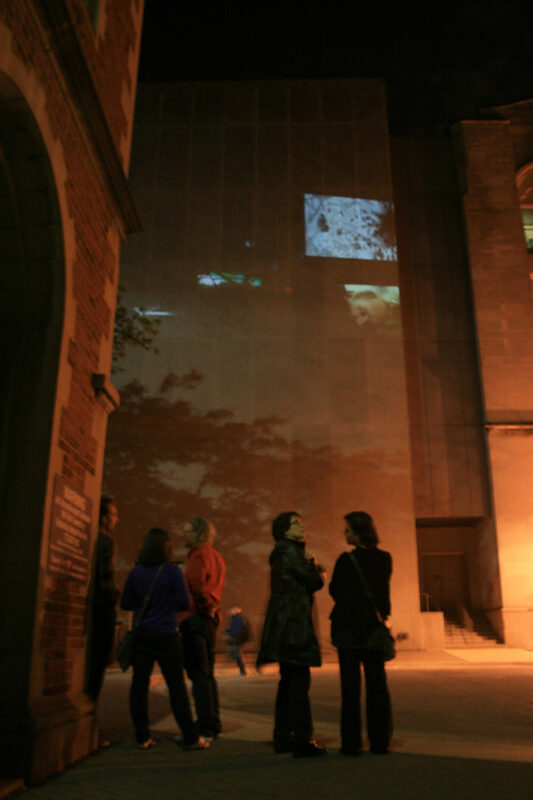 Documentation will be made of the actual projection and exhibition event. We propose to create a 7-minute video that explores the different processes of the brain through the use of the montage technique by creating original symbolic metaphors through video imagery and the use of archival material that can support the scientific technical explanations of brain processes. 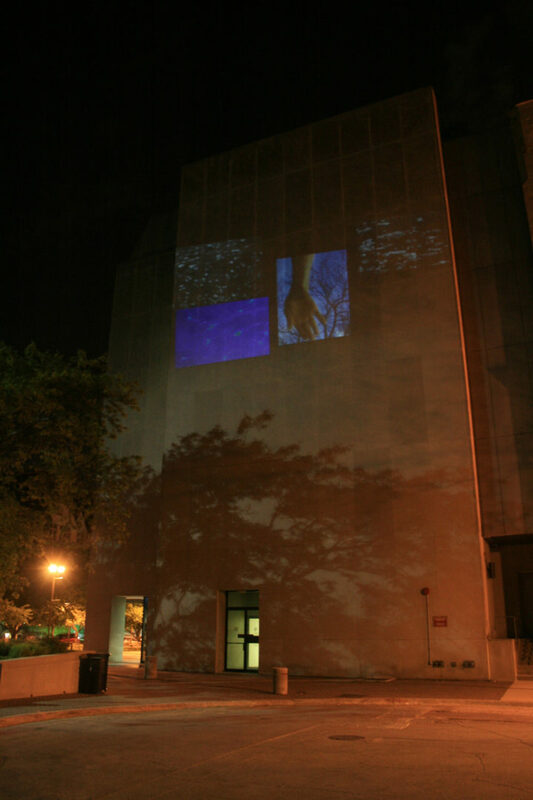 The final format will be a high definition video which will be projected through two video channels on the northern wall of the Surgery – Brain Research Pavilion (5812 South Ellis Avenue) from Macro’s third floor studio located at Ingleside Hall 956 E. 58th Street. Through technical innovations and in subject matter, art and science has always had a deep connection. Film Art is directly connected to this relationship from cinema’s early beginnings where many artists explored through creative films and theoretical writings the cinematic experience and its psychic connection with the audience. 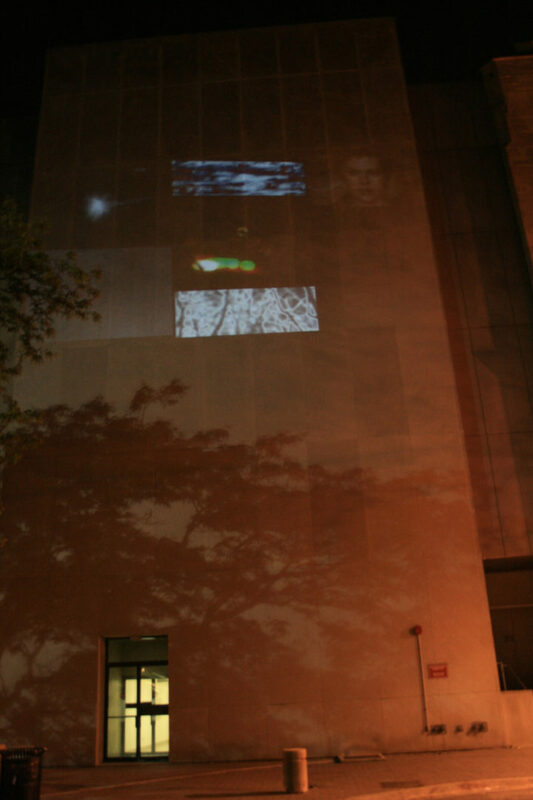 The art and science initiative and our creative collaboration will provide a platform inspired from the traditional temporal montage technique based on Sergei Eisenstein’s methods which also includes the concept that within the montage the use of the close-up not only derives emotion from the audience but that it also psychically connects the viewer to the projected image. These two traditional techniques will be joined to Marco’s own style of production, editorial and projection methods, currently exploring the concept and use of the spatial montage and projection performance. Eisenstein’s view that “montage is an idea that arises from the collision of independent thoughts” wherein “each sequential element is perceived not next to the other, but on top of the other” will be the formal basis of the film. This technique will be expanded upon by not only creating a montage within one moving image sequence, rather I will be creating multiple sequences, through original and archival content, that are layered one upon another, or in different sections of the frame, creating an audiovisual composition that is constructed as a geometric mandala. Thus the challenge is balancing between the classical temporal montage, where images move one after another, to a spatial montage sequence, where images co-exist simultaneously. Each moving image sequence will be cut in and out in a rhythm that can symbolically represent the spatiotemporal dynamics of neural activity, so that the entire video frame can on one hand represent the collective processes of the brain, while on the other hand work as window into the natural world of metaphors. 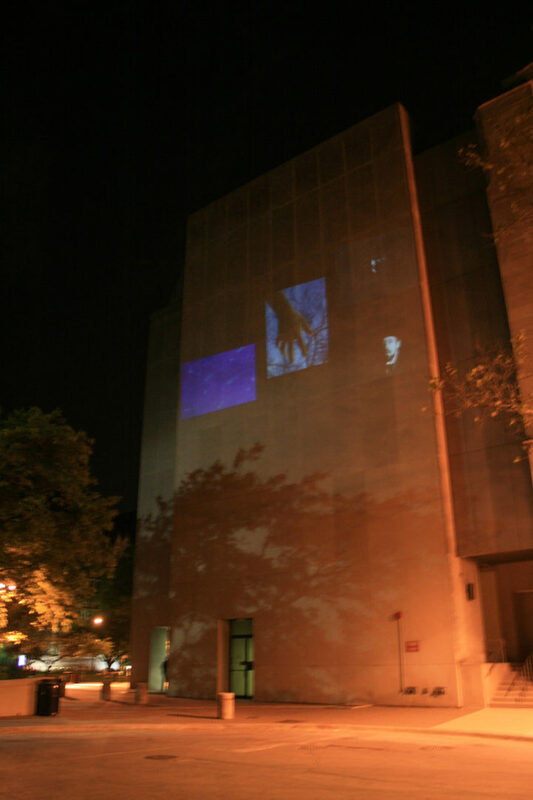 Through the use of two video projectors the video frame will be expanded length wise, allowing for the ability to explore the spatial montage so that multiple sequences co-exist. This formal artistic technique naturally supports the conceptual ideas of Jared’s studies, while creatively promoting the general process of studying the brain through the field of neuroscience. In creating a “promotional” piece we render an outlet for examining the process of scientific promotion itself. Dissonance between scientists and the public remains a prominent result of scientific explanation. To further explore this idea, the montage will be framed by a narrative between members of both parties. Scientific findings, as relate to studies of the brain, are verbally presented, to which a public response is given, conveying feelings of distress. 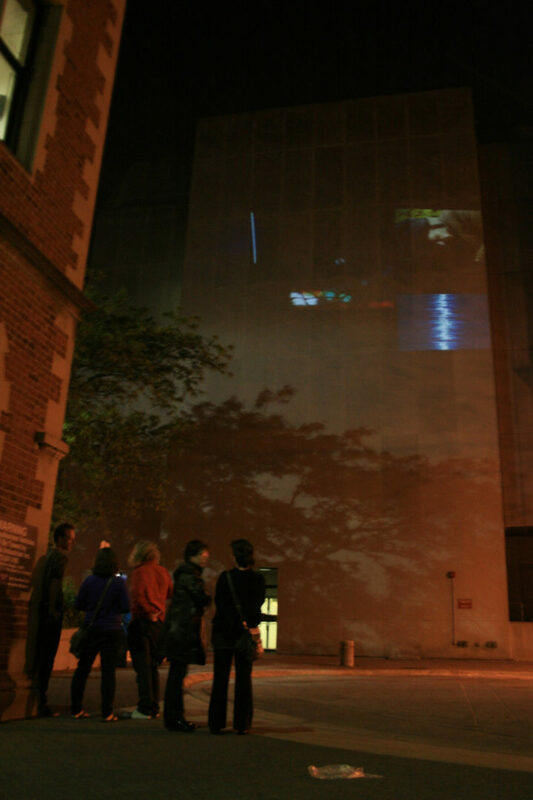 The arising tension serves to perturb the viewers interpretation of the seemingly harmless and wondrous video, in turn bringing to light the actual relationship between the public and sciences. Yet, underlying the feelings of confusion and dismay is a harmony formed from the ironic nature of brain sciences. That is, the brain is both the subject of inquiry and the means of performing such. This circularity is found throughout the piece at many levels and promotes a rhythm in the piece, composed of chaotic material. In itself this is truly a representation of the brain, with its complex internal interactions that result in our simple, harmonious perception of the world. Projecting the final piece onto the Surgery – Brain Research Pavilion will allow for this connection in a public space between the public and where the field of research and its implication takes place. The viewer will be attracted to or repelled by the piece as is the case for scientific ideas as they are explained to the public. 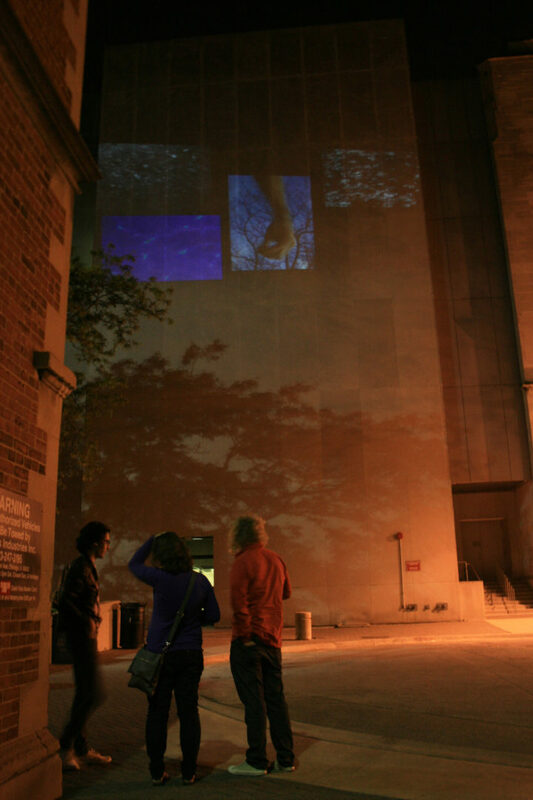 The piece naturally becomes a representation of a scientific idea in its attempt to gain public acceptance, creating a situation where everyone is interacting in the piece. Those that watch interact in promoting the piece, while those that choose not to watch decrease it’s acceptance. The existence of the piece itself becomes meaningful, even if no purposeful interaction is attempted. 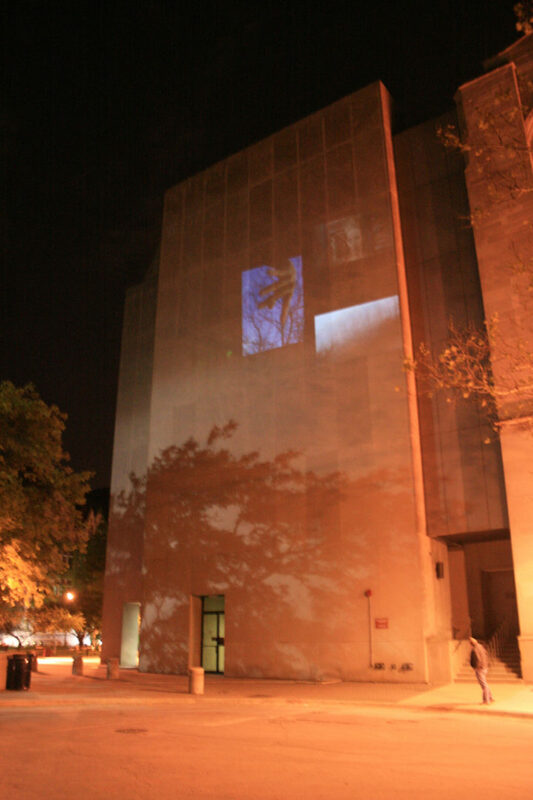 – Marco G. Ferrari’s series of abstract projection videos. Special thanks to dancer Wendy Clinard for her ‘hand dance’! – “Actin motility in dendritic spines”; “Birth”, 2004, Jonathan Glazer; “Chinatown”, 1974, Roman Polanski; “Dendritic Spines and Linear Networks”, 2011, Dr. Rafael Juste, National Institutes of Health Podcast; “Dynamic actin filaments in dendritic spines”; “Dynamic calcium activity in human neural progenitor cells”; “Epileptiform Activity in the Mouse Auditory Cortex”; “Guess Who’s Coming to Dinner”, 1967, Stanley Kramer; “Hubel & Wiesel – Cortical Neuron – V1”; “L’important c’est d’aimer”, 1975, Andrzej Żuławski; “Mouse cortical neurons”; “Movie 2. Calcium imaging of cholinergic waves”; “Neural Plasticity and Diversity in the Adult Mammalian Brain” 2011, Dr. Fred Gage; National Institutes of Health Podcast; “Neurons. Brain Cells WWW.GOODNEWS.WS”; “Probabilistic Inference in Neural Circuits: From Humans to Insects”, 2010, Dr. Alexandre Pouget. National Institutes of Health Podcast; “The Elephant Man”, 1980, David Lynch; “The Innocents”, 1961, Jack Clayton; “The Shining”, 1980, Stanley Kubrick; “Two photon imaging in the PV retina”; “Ultrasound-evoked Calcium Transients in Neurons”; “Watching a mouse’s brain think about running with GCaMP3”, 2009, Daniel Huber.